A 12 year old Indian boy successfully underwent open heart surgery for an extremely rare variant of Total Anomalous Pulmonary Venous Connection (TAPVC) at Sri Muthukumaran Medical College and Research Institute, Mangadu, Chennai. Prabhakaran, a ‘blue baby’ born with a heart birth defect seen in only 1 out of every 500,000 births, had 2 “hearts” inside his chest, one within the other. This complexcongenital heart disease is so rare that it merited selection out of 430+ submissions to be presented at the recently concluded international conference of the Indian Association of Cardiothoracic Surgery (IACTS) at Mumbai in February 2013. In an intricate open heart operation that lasted 5 hours, the cardiothoracic surgical team including Dr.S.Sivasubramanian, Dr.S.Visvakumar and Dr.Meenakshisundaram successfully repaired the defect. Unable to afford the high cost of treatment, Prabhakaran’s widowed mother searched desperately for assistance with her son’s surgery. His operation was sponsored by theDr.Mani Children Heart Foundation, a Chennai-based NGO which has funded 100 heart surgeries for under-privileged children with congenital heart disease since its inception in 2003. In the defect, a rare intracardiac sub-type of TAPVC, all 4 veins returning oxygen-rich blood from the lungs drained into a common chamber (the “pulmonary confluence”) – forming a mini-heart behind the regular heart. This mini-heart then pumped blood into the atrium through a hole in the heart called an Atrial Septal Defect (ASD), making him a cyanotic ‘blue baby’. Prabhakaran’s surgery was carried out on 16th October 2012. A week later he was discharged from hospital, his lips and fingernails now pink and healthy. The department of cardiothoracic surgery and cardiology at Sri Muthukumaran Medical College and Research Institute, Mangadu, Chennai has successfully carried out more than 75 operations on patients with valve, coronary and congenital heart diseases in the short period since its inception. Congenital heart disease (CHD) is rare, with an estimated incidence of 7 to 8 in 1,000 live births. Surgery is often risky and expensive, yet serious complications can arise if treatment is delayed. Bleach is a strong irritant, frequently linked to newly-acquired asthma. A recent decision by Compass Children’s Center in San Francisco to use exclusively “bleach-free” cleaning products resulted in visibly less asthmatic symptoms in both children and childcare workers. According to the U.S. Department of Health – National Institutes of Health (NIH), asthma affects more than 25 million people in the United States and over 230 million people worldwide. As asthma typically begins in early childhood, the NIH is committed to reducing environmental risk factors in children in order to prevent asthma before it begins. On the forefront of asthma prevention, the San Francisco Asthma Task Force in a 2011 report on Bleach Exposure in Child Care Settings , discovered a high correlation between bleach exposure and work-related new-onset asthma cases as well as the exacerbation of pre-existing asthma conditions. As a result they set about field-testing various sanitizers and initially recommended a number of bleach-free disinfectant and sanitizer alternatives. In late April 2012 the task force issued an interim update to the 2011 report with the discovery of an accelerated hydrogen peroxide sanitizer, SaniDate Ready-to-Use (RTU) Hard Surface Sanitizer. This sanitizer can be used directly on food-contact surfaces and as a fruit & vegetable wash, requiring only 1 minute contact time to eliminate over 99.9% of bacteria and human health pathogens. SaniDate RTU was also recently approved by San Francisco Department of Public Health and various city ministries have begun roll out of the product as it’s recommended bleach-alternative sanitizer for food-contact surface. The following video features the story of Compass Children’s Center in San Francisco and the lives of children in poverty that are being affected for the positive by reducing and preventing asthma through their transition to a bleach-free environment. SaniDate Ready-to-Use Hard Surface Sanitizer is available for retail or volume purchase through EnviroSelects LLC. • double the number of camps to 500 across the UK. To launch the pledge, golfer Lee Westwood and dancer Brendan Cole, whose specialist Academies are supported by The Co-operative, teamed up to give youngsters lessons in dance and golf, as well as swapping some professional tips with each other on the course at Rye Hill Golf Club, Banbury. Other sporting stars backing the pledge include former England cricketer Andrew Flintoff, tennis star Annabel Croft, Welsh rugby player Shane Williams, England’s Rugby World Cup winner Matt Dawson and GB Hockey player and Olympic hopeful Crista Cullen – all of whom will be working with The Co-operative to achieve this pledge through their specialist Academies. Simon Burns, Minister of State for Health and Co-Chair of the Responsibility Deal Physical Activity Network welcomed the new individual pledge on behalf of The Co-operative and Activate Sport. Cash strapped parents could be putting their children’s safety at risk by buying second hand infant car seats, industry experts have warned. New figures show that purchases of pre-owned child travel seats are rising, as families struggle to cope with today’s difficult economic conditions. Car accessories retailer Halfords reports that 7% of its customers admit they have recently bought second hand car seats for their children, a rise of 2% compared to figures from its 2009 customer survey. This is despite the fact that it can be virtually impossible to tell how old a second hand child seat is, if it has been involved in an accident, or even how to fit it, as most are rarely sold with the original fitting instructions or safety manuals. “A lot of wear-and-tear on a pre-owned child car seat may not be visible to the untrained eye and buckles and straps that look fine at first glance may actually be so damaged that they could fail during an accident,” warned Halfords Child Travel Expert Samantha Preece. Statistics on car accidents involving children are stark: every year 30 children between the ages of 0 to 11 years are killed, 400 seriously injured and over 7,000 slightly injured while travelling in cars 1. A correctly fitted car seat can help prevent some of these injuries. Lowell General Hospital and Floating Hospital for Children at Tufts Medical Center are sponsoring The Merrimack Valley Moms Blog Contest from May 3, 2010 to May 24, 2010. All area mothers are invited to enter. The contest will culminate with four moms winning $250 each and being selected as featured mommy bloggers for the Merrimack Valley Region. “Moms today value exchanging ideas. Whether it’s the newest kid-friendly restaurant, a book review, or advice on work-life balance, they love to share with other mothers. We want to help with that. Through the Merrimack Valley Moms Blog we hope to connect local moms with one another and facilitate the sharing of information that they value,” says Michelle Davis, Lowell General Hospital’s Director of Marketing Operations and Community Development. To enter the contest, visit Lowell General Hospital’s Facebook page and become a fan by clicking the Like button. Upload a video or post a short essay on why you’d be a great mommy blogger. If your post is persuasive- whether it’s funny, touching or engaging, you could be one of four area moms selected for a $250 prize and the opportunity to become a Merrimack Valley Moms featured blogger. To enter go to http://www.facebook.com/LowellGeneralHosp. Each featured blogger will write at least one post a month. The topics will vary greatly, depending on the personalities of the bloggers and their range of daily experiences in the community. Some of their blog posts will come in the form of video posts. The bloggers will meet in person every other month at ‘blogger brunches’ to share ideas and brainstorm upcoming topics. The Merrimack Valley Moms Blog will provide a forum to share views, experiences and tips with area moms. Of course, dads are welcome to read the blog as well! To visit the fledgling Merrimack Valley Moms blog, go to http://www.mvmoms.com. Traveling out of state or country for medical treatment, commonly referred to as medical tourism, is now catching on with parents seeking specialized surgeries for their children. In the last few years, parents f r o m around the world have flocked to the United States for specialized pediatric surgeries. And American parents have sought help in countries with nationalized healthcare or more affordable surgeries, such as India. But as with all surgical procedures and practices, experts are advising caution. Dr. Armen Ketchedjian, author of the book Will It Hurt? A Parent’s Practical Guide to Children’s Surgery, says that any parent looking for the best care for their child should place quality first, and that any decision made about surgery should be done with the advice and counsel of the child’s pediatrician. Hospitals like Beaumont Hospital in Royal Oak, Michigan, have adapted to the trend and deal with families f r o m around the world—200 f r o m Italy alone—who travel there to take advantage of the hospital’s specialized surgeries to restore vision in premature babies. These tips and more are part of Dr. Ketch’s efforts to give parents some insight into the world of pediatric surgery. He says hopes that more parents will take advantage of resources like his to learn about their options before making a final decision about where to take their child for surgery. Will It Hurt? helps educate parents about pediatric surgery. It is an easy-to-read resource that will give parents, children and families the help and reassurance they need to make surgical experiences as stress-free as possible. (Will It Hurt? 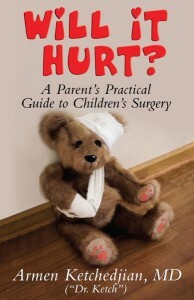 A Parent’s Practical Guide to Children’s Surgery by Dr. Ketch; ISBN: 0-9815373-0-8; $14.95; 172 pages; 5½” x 8 ½”; softcover with illustrations; WARREN ENTERPRISES, LLC). Just five years ago, a child that suffered damage to brachial plexus nerves, the nerves that pass signals between the brain, hand and arm, would have been hard pressed to recover fully because surgical techniques couldn’t provide a fix without pulling nerves from another part of the body, leaving a numb spot. Now a new surgery pioneered at the St. Louis Children’s Hospital is offering hope to these kids through a revolutionary process that cuts the ends off the damaged nerves and attaches them to healthy but lightly taxed nerves allowing a child to recover some, if not all, movement. Dr. Armen Ketchedjian, author of the book Will it Hurt? A Parent’s Practical Guide to Children’s Surgery, says that parents of children in need of surgery are often drawn to new surgical techniques in the hope of finding a way to help their child. He recommends parents find trusted sources of information and ask the advice of their child’s doctor prior to making a major decision about treatment.